Some costume duplications are inevitable of course. There were quite a few Jokers (although I saw just one Heath Ledger Joker) and also many Harley Quinns (all in Harley's original garb, none in her New 52 get-up). Silver Age Flashes were plentiful as well; take a look up above at what Jeanette was able to snap a photo of. Three unrelated Flashes converged on the spot where Superman was flexing and one of those four gents had a great idea. 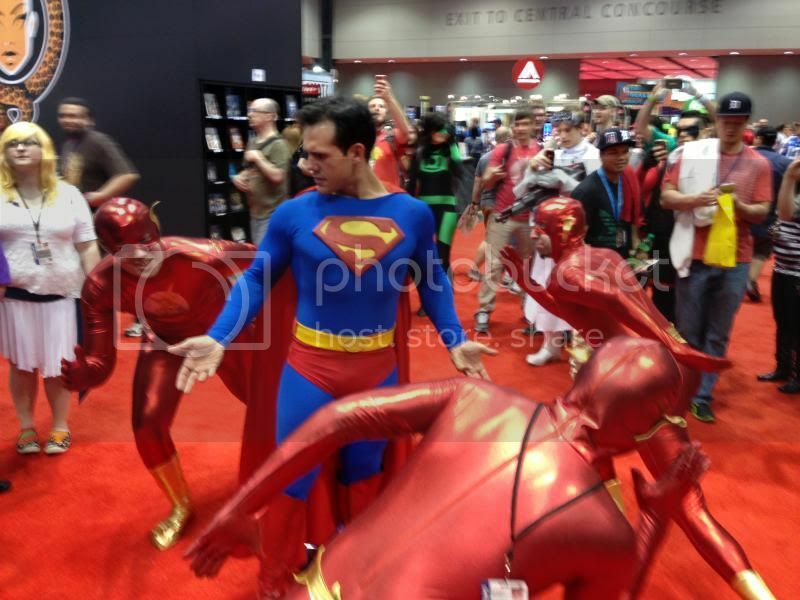 The three speedsters posed equally spaced in a circle around Superman as if it were one fast runner that we were seeing surround the Kryptonian. Brilliant! 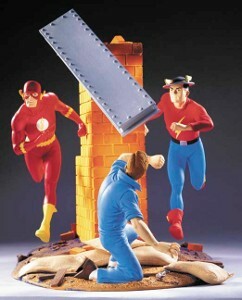 I think Carmine Infantino would have gotten a kick out of that photo. Wouldn't you like to know exactly what stories Jack Kirby drew for which four different companies in September of 1957? You can! A gent named Ray Owens has compiled a month-by-month list of all the comics stories drawn by Mr. Kirby from 1938 through 1995. I find it fascinating and you can inspect it for yourself over here. By the way, Jack Kirby never drew My Little Pony in any month. I wrote a number of articles about Before Watchmen a year or so when DC Comics was gearing up for its initiative. This one was an aggregation of how some industry professionals said they felt about the matter. The gently breathtaking Jae Lee artwork on the Ozymandias series was my favorite in all of the Before Watchmen books, but did these series accomplish anything? All this useless beauty. Elvis Costello crafted that phrase years ago and I feel it applies perfectly to Before Watchmen. Maybe you'll listen with me as Mr. Costello sings his composition for us. Ron Marz tweeted out to Chicago last weekend that there would be a signing at Third Coast Comics later that day. I tweeted back that I would try to cart the entire hayfamzone over to that event. And I made it! 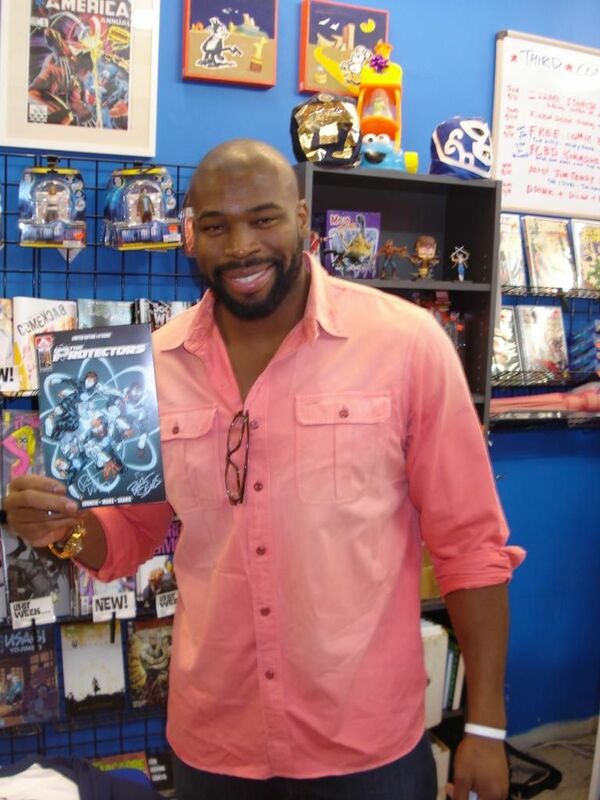 I shook hands with football player Israel Idonije of the Chicago Bears at Third Coast and he signed his new comic book for me. 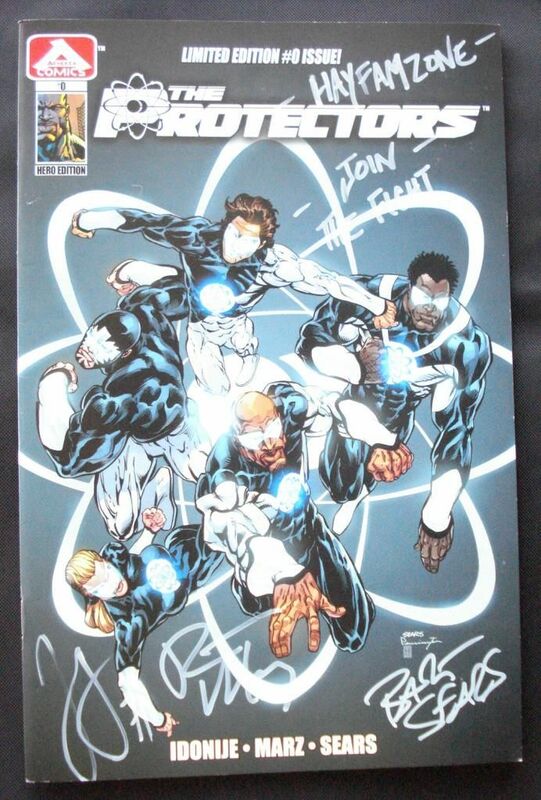 Mr. Idonije's idea was fleshed out by Ron Marz and Bart Sears into The Protectors. The preview issue #0 that is out now does not tell very much of the story but the Bart Sears artwork is great. Issue #1 will follow in a few months. Here are a couple of modern-day takes on Betty and Veronica from the Archie comics. Look for yourself right over here. I like quite a bit about each strip (but I do wish a little more attention had been paid to the lettering). The annotations that follow the strips are extensive and make for a fun read themselves. I'm always on the lookout for interesting things like this! David Finch is the first. Am I right? He signed his cover of Katana #2 with his twitter handle, @DFinchArtist. Has any other comics artist done this previously? I do not think so. How have I chosen to commemorate the occasion? By following him, of course! I am the 1806th of his followers. The homage was subtle enough that it's taken me years to connect the dots. Alex Ross painted the above masterpiece to commemorate the 9/11 tragedy and of course I liked it as soon as I saw it. But I did not until this very week realize that the painting is a clever homage to the 1944 cover to Big All-American #1. I am not the only one to draw this parallel but the connection did escape quite a few observers. I see there were discussion boards where debate raged as to whether Superman's "Wow" enhanced or deterred from the impact of the piece, but only someone not aware of the original source material would question the word balloon's inclusion. Below, for comparison, is the Big All-American cover. More accurately, this is Jeanette's wonderful animation of that iconic cover (and please take a look back here for a reminder about all that). Here is one more iteration I found of the same design, just for a chuckle. Okay, here's just one more. Jack Kirby's Etrigan on the Radio! Imagine my surprise recently when the disc jockey said "Etrigan" on the radio! Etrigan was of course the name of Jack Kirby's Demon in the wonderfully fun 1970s DC series, and that name is not commonly heard in everyday parlance. The radio channel was Chicago's highly regarded WXRT (whose studios I toured three decades ago, as I told you about back here) and the DJ was Frank E. Lee, whom I had never before heard refer in any way to comic books in all the years I've been listening to him. He was introducing the new song Demon to Lean On by The Wavves and he wove Etrigan into his ad lib. Nice! The gentleman went on to say that he had posted a blog article about comic books so, naturally, I went to see what was up with that. It turns out that Mr. Lee is a fan of Neil Gaiman's Sandman! This Calvin and Hobbes "movie trailer" is a very entertaining three minutes. It starts out interesting and then goes in a direction I did not anticipate. I'm glad the beloved snowmen get to make an appearance! There are a bounty of "watch the artist draw" videos on youtube, but here is one of my favorites in which Freddie Williams II begins with a blank sheet of paper and ends up with the Superman drawing partially shown above. 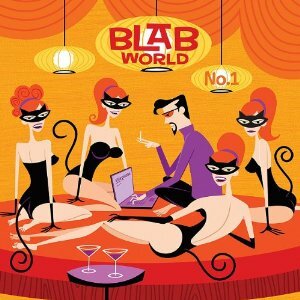 Blab World #1 was published in 2010 as the first issue in a series to serve as a replacement for Blab magazine. Blab published 18 issues between 1988 and 2007 and I managed to obtain exactly zero of those eighteen; I didn't know what Blab was in the beginning and then I didn't feel comfortable climbing on the train after it was already in motion (you know, same old story). The coming of Blab World seemed like more or less a fresh start so I decided to find out what was going on over there. A hardcover book of an unusual size, it's an attractive enough package. There are a few articles, including a history of Weirdo magazine which includes (as you might expect) some nice R. Crumb artwork. Most of the issue consists of full-page paintings which are interesting enough to look at, but the comics content is too sparse to hold my interest. A second issue of Blab World has been published and I was planning on getting it but I think I'll pass. I enjoy writing and drawing my own comics and I like it when other people create their own comics. It's so much better to get out onto the tennis court yourself instead of always watching the match that's on TV. Here's a one-page Deadman vignette I stumbled across online. The page has a fun energy about it! Today I drew this Ming. One of my ebay buyers won a 1966 Flash Gordon from me last week and wrote me a note saying that the comic book was for her grandson Gordon (whose nickname is Flash) and how much her grandson likes Flash Gordon. My first idea was to draw a Flash Gordon for him, but Ming the Merciless is so much more fun to draw! I just stumbled across the above page of artwork: John Byrne's Fourth World character designs apparently from when he was getting started with Jack Kirby's New Gods and Forever People. Interesting! The Watchmen made some news last year, and now it will be convenient for you to dress up like one of those beloved characters. A Rorschach mask has been designed with moving inkblots that react to your breath! You can watch two videos of the mask in action over here. I recently wrote a little bit about Gaspar Saladino back here, but just wait until you hear what I have to tell you about Mr. S today! The above logo for a still-upcoming new comic by Chuck Dixon and Graham Nolan is a 2012 design by Mr. Saladino. Let me explain why that is significant. Gaspar gave DC Comics covers their distinctive look in the late 1960s and early 1970s. 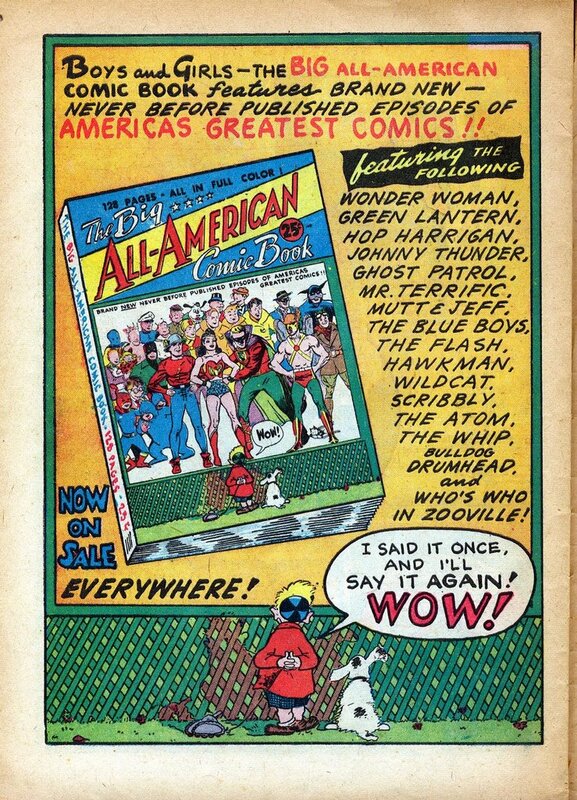 Let me try to drive my point home more clearly by pointing out that the gentleman began his lettering career in 1951. Let me stop beating around the bush and spell it out in capital letters: BORN IN 1926, GASPAR SALADINO IS 86 YEARS OLD! It is so great that the gentleman still keeps his quill in the ink! But wait, I haven't told you the latest. Just a few weeks ago Dark Horse Comics Presents #21 was released. I've been enjoying this series since it was revived (as I told you back here) but something is particularly noteworthy about this new issue. One story in there, The Day the Saucers Came by Neil Gaiman and Paul Chadwick, is lettered by Gaspar Saladino. If I'm reading the Grand Comics Database correctly, this marks the first time that the gentleman has lettered a story since 2004! Hooray for Gaspar Saladino! Back here I showed you how artist Hanie Mohd envisioned a number of comic characters dressed up in warm sweaters for the fall weather, and today I'm pleased to share some character designs by Michael Lee Lunsford. 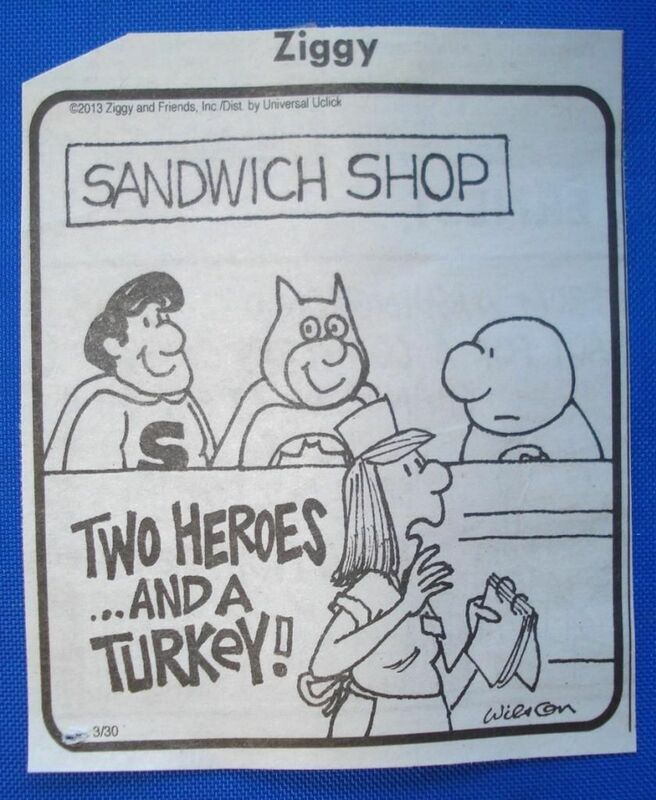 Of course Power Girl has been known for donning a fairly skimpy outfit for most of her career, but Mr. Lunsford's version shown above is considerably more modest. You can see the gentleman's similarly-themed drawings of Wonder Woman and Supergirl and Vampirella and Zatanna and others over here. 2. When I was a teenager starting up my original art collection, I bought a Silver Age Flash splash page by Mr. Infantino for $9. Being young and flighty I decided I didn't like the page enough, so I sold it. For $10. 3. 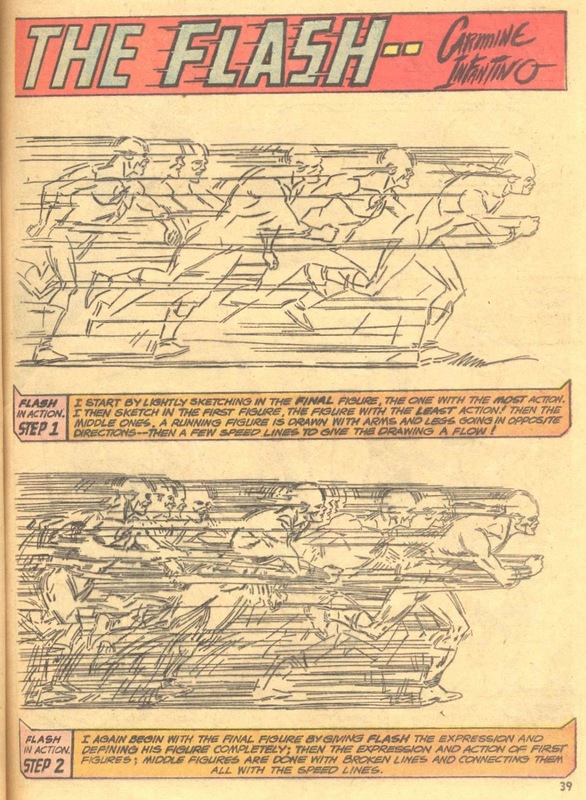 I have explained before why The Forever People #1 is my favorite comic book of all time, and I have Carmine Infantino to thank for that comic book's existence. 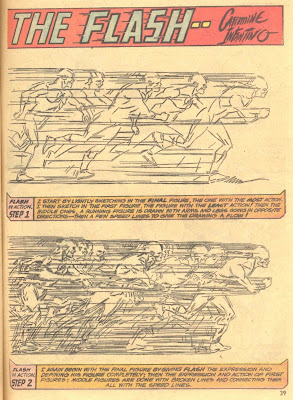 It was Mr. Infantino who lured Jack Kirby to DC to create the Forever People and all of his Fourth World. Thank you, Carmine Infantino. 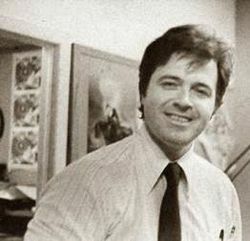 The above photo was posted in a few online oases this week and labelled as "Young Neal Adams." I haven't seen that picture for decades but I recognized it immediately as the reference I used when I drew a likeness of Mr. Adams back in 1978. Revue magazine was the weekly entertainment section of The Daily Illini (the newspaper where Mr. Roger Ebert got his journalistic start, by the way). I conducted a phone interview with Mr. Adams (who was absolutely my favorite comic book artist at that stage of my comic fan evolution) to coincide with the release of the tabloid-sized Superman Vs. Muhammad Ali comic. 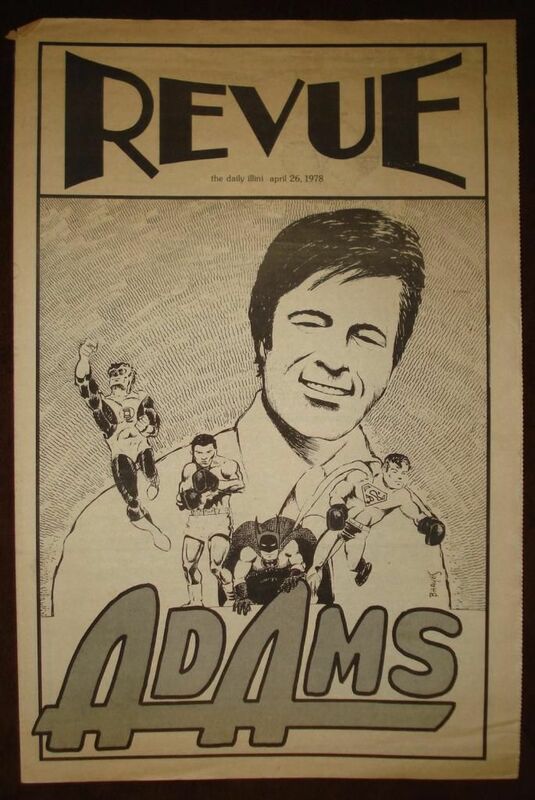 The editor of Revue was comics fan Ken Paulson (who went on to become the editor of USA Today for a few years a few years ago and to whom I introduced you back here) granted my request to draw the cover of the issue that contained my Adams interview, and I display an image of that printed cover down below. I add with a smidgen of pride that I also designed that logo for Revue. The Adams article itself? I'll share that another day. Way back here I showed you the full-size Hembeckified cover to The Forever People #1 that I had commissioned. I've been meaning to mention that Fred Hembeck also makes his artwork available to his fans in smaller, bite-size chunks. A couple of years ago I purchased these dandy sketch card originals of Jack Kirby's Orion and Darkseid and Lightray. I invite you to visit Fred over at www.hembeck.com and maybe you'll find something you'd like to add to your collection. In the hayfamzone it's all treats and no tricks.